I had the pleasure of guiding Kip and Wendy from the Chicago area on the French Broad and Little Pigeon Rivers. Originally, they had scheduled a trip with me on Monday, but the forecast of scattered showers on Sunday did not materialize so they decided to sneak in a late afternoon and evening trip in addition to our outing on Monday. TVA over the past several days had been generating around a 12,000 cfs average making it again difficult to fish the French Broad. However, today it had dropped back to 6000 which opened some doors for us to fish some spots on the French Broad. We started fishing in the Little Pigeon with very little success even though the water was clear and the temperature was fifty-one degrees. We made a move to the French Broad where the water was stained and the temperature was in the upper forties. 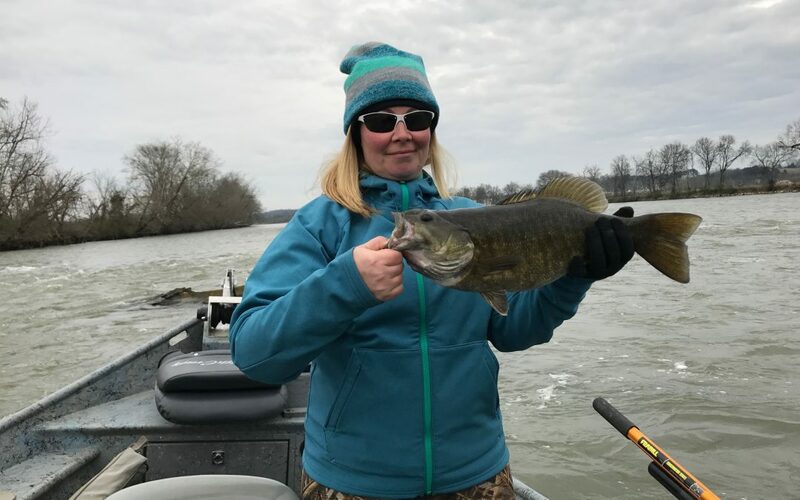 Stand up jigs combined with soft plastic crayfish was the ticket for Wendy as she managed to catch a hefty eighteen inch smallie (pictured above) and several drum the biggest weighing ten pounds. Kip was fishing with a variety of artificials and managed to tag a couple of hard fighting fifteen inch smallies. 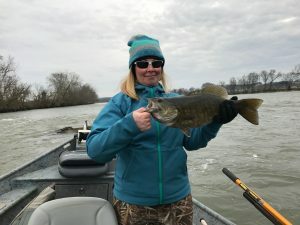 Where we fish tomorrow will be much different because the forecast from TVA is that they will be generating again at 12,000 and the spot where we had some success today will be unfishable. But Kip and Wendy are troopers and I know they will be up for the challenge on Day 2.